Assistant Professor: Yasumasa Watanabe, Dr. Eng. The research fields of our laboratory are the aerodynamics (from low speed to hypersonic (i.e. Mach number higher than 5) speed of atmospheric entry), the dynamics of various fluids (not limited to the air), and application of those knowledge and technology to lunar and planetary exploration in the future. 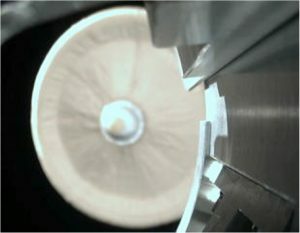 The umbrella-type flexible and deployable aeroshell made from membrane materials seems promising for atmospheric entry vehicle because of 1) its high efficiency for aerodynamic deceleration (even in low-density atmosphere of Mars) due to its low-mass and large-area property, 2) significant relaxation in aerodynamic heating environment due to deceleration in relatively lower atmospheric density at higher altitudes than that for entry vehicles having conventional heavy “hard” aeroshell, 3) highly efficient storage in the container before deployment and so on. Those features are advantageous especially for planetary exploration using micro landers within severe mass budget. With the co-researchers in other universities and JAXA/ISAS, we have been continuously developing various test vehicles and successfully demonstrating their performance: balloon-drop subsonic and transonic flight tests in 2003, 2004 and 2009, supersonic re-entry flight experiment using a sounding rocket in 2012, and orbital decay/atmospheric entry flight experiment using a nano-satellite released from ISS (the International Space Station). The membrane aeroshell vehicle is apparently suitable for entry flight in low-density atmosphere like Mars. 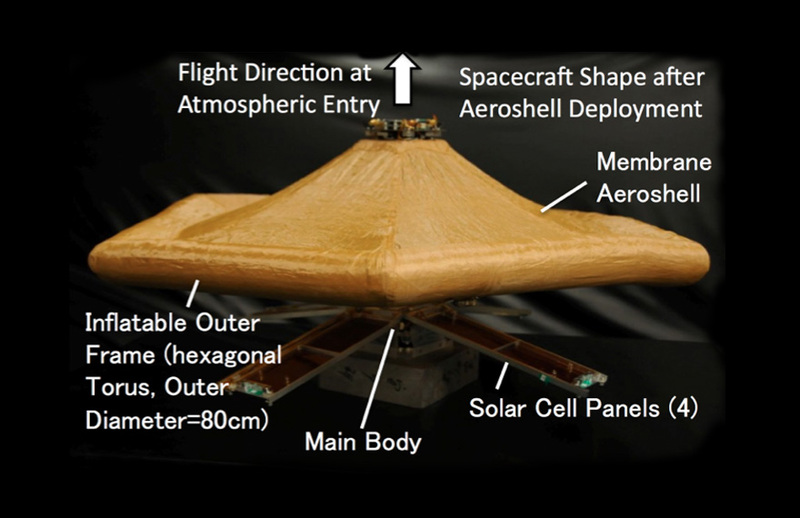 The Mars exploration mission using a small (less than 100 kg) spacecraft composed of a micro orbiter and a micro lander with membrane aeroshell is being studied. The spear-like probe called “penetrator”, which penetrates under the ground of the moon, planets, comet nucleus and asteroids using its kinetic energy of the high-speed impact and explores the interior of those objects, seems promising for small and low-cost mission, because it efficiently utilize the kinetic energy of the interplanetary flight for high-speed impact and additional devices like a drill are not necessary. The behavior of the regolith around the penetrator looks quite similar to that of the compressible gas around a vehicle flying at high speeds. 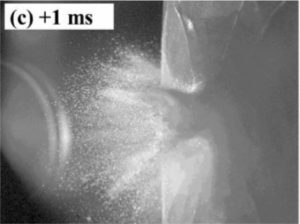 Applying the knowledge and technology in the fluid dynamics, the experimental study on the penetrator using the ballistic range and the numerical analysis are made for understanding of the penetration dynamics. When a probe enters the planetary atmosphere to land on the surface, its velocity becomes extremely high, for example, 8 km/s from a Low Earth Orbit, 3.5-4 km/s from a Martian orbit. During the atmospheric flight at such high speeds, the probe is surrounded by high temperature gas, because the kinetic energy of gas molecules colliding with the probe’s surface is converted to the thermodynamic energy. In such high temperature gas, complicated phenomena, such as, chemical reactions (dissociation, recombination, ionization etc. ), excitation of internal energy modes (vibrational, electronical etc.) of the gas, occur. A probe in high temperature fire-ball-like gas receives severe aerodynamic heating from the gas, and its surface will be seriously damaged due to ablation (thermal decomposition, oxidation, sublimation and so on at the surface) without having an appropriate thermal protection system over the body. Similar phenomena also occur at the surface of a natural atmospheric entry object (meteor). 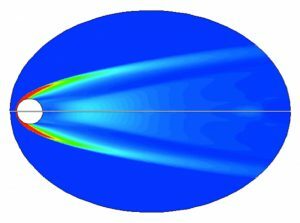 To understand these phenomena and to design a good atmospheric entry probe, the hypersonic and high-enthalpy gas dynamics is quite important and is extensively studied numerically by Computational Fluid Dynamics (CFD) and experimentally by the hypersonic wind tunnel, shock tunnel, plasma tunnel and so on.